Grosgrain Ribbon: 2.25", 1.5"; 7/8 ", 3/8"
Orange and black mixed together help bring in the Fall and Halloween. 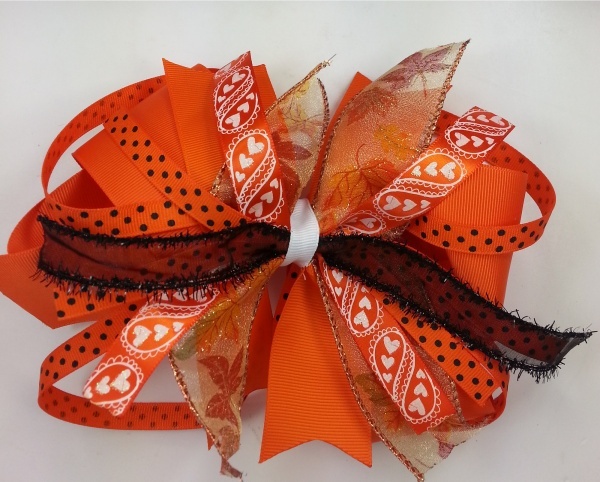 This festive bow catches the Spirit of Fall with orange leaves, white hearts and black polka dots. The bottom bow is an orange 2.25 inch grosgrain ribbon with a pinwheel of seven inch strips of ribbon on top. The pinwheel has orange, gold sheer with leaves, orange with white hearts, orange with black polka dots and a black sheer through the center. The polka dots ribbon is also in the four corners of this bow for big loopers and a white grosgrain is in the center. Enjoy the Fall with the bow that will match the occasion.